Queers for Social Justice led a march on Monday—part of their effort to maintain Pride's political side. 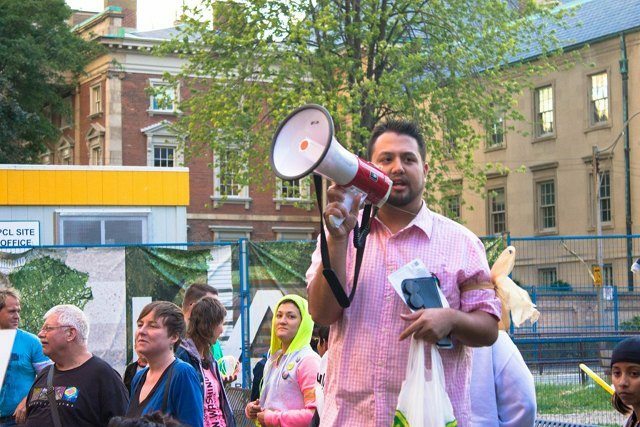 Casey Oraa leads the Queers for Social Justice night march. More than 400 trans, queer, and allied activists and protesters took to the streets Monday evening for a night march held by the newly formed group Queers for Social Justice. The eclectic crowd paraded through the downtown core from Nathan Phillips Square to Cawthra Park, near Church and Wellesley streets, taking over Queen Street, Yonge Street, and Carlton Street along the way. Taking over the Yonge/Queen intersection and bringing the march north up Yonge Street seemed like a daunting challenge, but Oraa and his marshals confidently stopped traffic and brought the crowd through without incident. While some cars pulled out and turned around, most waited out the inconvenience patiently. Many honked in support of the cheering, chanting participants. One young man gamely tried to lead the group in a number of French slogans taken from the Quebec student protests, but few seemed confident enough to show off their French-speaking skills in such a public arena. 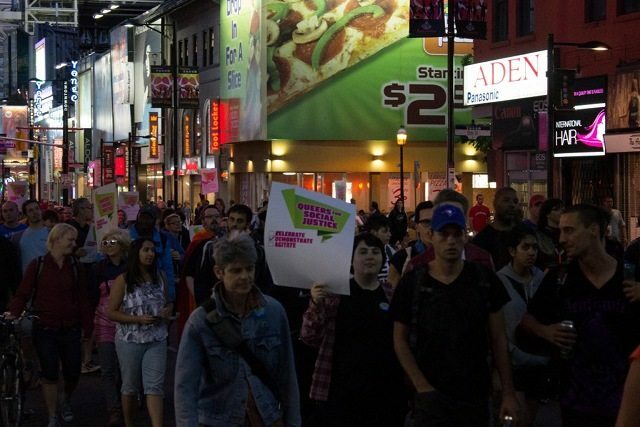 The night march works its way up Yonge Street. As each intersection along Yonge Street was secured and overtaken, the crowd grew more exuberant. The turn from Yonge onto Carlton Street posed another challenge (and a bit of confusion as some marchers assumed they’d be continuing north to Wellesley Street), but once again skilful marshaling ensured that none were left behind. By the time the march reached Carlton and Church Streets, the activists’ shouts were ringing out among the high-rises and a feeling of celebration was in the air. At Carlton and Church Streets, the marshals once again secured the intersection so that the march could turn north—but an unmarked grey van with uniformed Toronto police officers attempted to push into the intersection and, disconcertingly, into the crowd, leading some to believe that the police were attempting to disrupt the march. “I saw a grey/silver van push in toward our crowd,” said Oraa, “doing a stop-and-go sort of manuever a couple of times. I sent my runner to go check it out and he came back and told me it was two police officers…. Apparently, the officers had been pushing into the crowd to get closer to find out if we needed help with traffic control, et cetera, and if we were okay.” Moments later, several police officers on bicycles arrived alongside the march further up Church to more effectively accompany and facilitate the procession.